Not to be confused with Nordic countries. 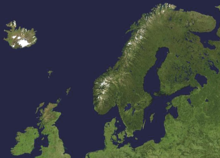 Northern Europe might be defined roughly as the British Isles, Fennoscandia, the peninsula of Jutland, the Baltic plain that lies to the east and the many islands that lie offshore from mainland Northern Europe, Greenland, and the main European continent. Nations usually included within this region are Denmark, Estonia, the Faroe Islands, Finland, Iceland, Latvia, Lithuania, Norway and Sweden, and less often the United Kingdom (especially Scotland), the Republic of Ireland, northern Germany, northern Belarus and northwest Russia. The area is partly mountainous, including the northern volcanic islands of Iceland and Jan Mayen, and the mountainous western seaboard, Scotland and Scandinavia, and also includes part of a large eastern plain, with Lithuania, Latvia, Estonia and Finland. The entire region's climate is at least mildly affected by the Gulf Stream. From the west climates vary from maritime and maritime subarctic climates. In the north and central climates are generally subarctic or Arctic and to the east climates are mostly subarctic and temperate/continental. Just as both climate and relief are variable across the region, so too is vegetation, with sparse tundra in the north and high mountains, boreal forest on the north-eastern and central regions temperate coniferous forests (formerly of which a majority was in the Scottish Highlands and south west Norway) and temperate broadleaf forests growing in the south, west and temperate east. Countries in Northern Europe generally have developed economies and some of the highest standards of living in the world. They often score highly on surveys measuring quality of life, such as the Human Development Index. Aside from the United Kingdom, they generally have a small population relative to their size, most of whom live in cities. Most peoples living in Northern Europe are traditionally Protestant Christians, although many are non-practicing. There are also growing numbers of non-religious people and people of other religions, especially Muslims, due to immigration. In the United Kingdom, there are also significant numbers of Indian religions such as Hindus and Sikhs, due to the large South Asian diaspora. The quality of education in much of Northern Europe is rated highly in international rankings, with Estonia and Finland topping the list among the OECD countries in Europe. 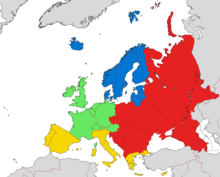 The Hansa group in the European Union comprises most of the Northern European states. ^ "Population, total". data.worldbank.org. World Bank. Retrieved 21 March 2019. ^ "Finland's population was 5,503,297 at the turn of the year". Tilastokeskus.fi. Statistics Finland. Retrieved 17 August 2017.